Jim McIntyre is urging his Ross County players to follow last Saturday's draw at Motherwell with a home win over Hamilton on Saturday. That point lifted County off the foot of the Scottish Premiership table and ended a run of three straight defeats. The County manager said: "It's about momentum, which is everything in football. "We saw that at the start of the season with Hamilton. We want to get back-to-back results and climb the table." County have scored nine times in their last five outings but they have conceded the same amount in those games. 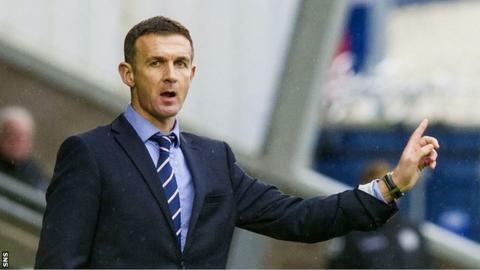 "We need to keep more clean sheets," McIntyre told BBC Scotland. "We are showing that we have goals in the side but we need to be resolute at the back and have a bit of nous. "There's such a thing as a good foul at times, if a team is breaking on you. We can certainly do that a little bit better." The former Queen of the South boss looks forward to having a settled squad but admits that is some way off, with him having only joined the Staggies at the end of August. "Any manager is always on the lookout for players and I'm no different. As always, when a window opens you want to add a couple of even better players to help the good players that you already have. "I've inherited somebody else's team," he said. "We've made several changes already and there will be more changes. But going forward, I'm not someone who likes to make seven or eight signings in every window. "Competition for places is key, that keeps everybody else on their toes. "But we've got the nucleus of a squad here that I think are really capable of picking up more points and climbing the table."